The Maratek TORS (Transformer Oil Recycling System) is designed to treat the insulating oils used in high voltage transformers and switch-gears. It encompasses the latest technological innovations yielding extraordinary performance without sacrificing environmental standards. A unique feature of the TORS is the reactivation system of the activated media. The reactivation is accomplished without interrupting the purification/regeneration process. 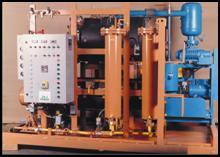 TORS may be used to treat oils "In situ" with live transformers, or in the plant. TORS systems are specifically designed to customer specifications. The performance table below shows typical performance of a TORS System. Note that the TORS System exceeds ASTM Standards. 3000 lbs. of FE will treat 15 000 gallons of insulating oils before reactivation, based on oil entering at 0.2 mgKOH/g. 3000 lbs. of activated Alumina will reduce the acidity level to accepted norms of 60 000 gallons of insulating oil. TORS models are tailored to meet your requirements and integrate as seamlessly as possible into your production process. Contact us to discuss your specific needs or to obtain more details on equipment specifications.